Dr. Manning appeared on Good Morning America on March 27, 2008, for an investigative story on the outrageous practices of subprime credit cards. October 25, 2011 -- The Willis Report -- Credit Card Companies Invading Your Privacy? October 25, 2010 -- Credit Union Times --Credit Unions warned again about Wal Mart threat. September 7, 2010 -- Attorney General --S.U.N.Y landmark agreement. February 23, 2010 -- Democracy Now -- "Credit Card Nation: The Consequences of America's Addiction to Credit"
December 23, 2009 -- NPR -- "Many Mine Bible For Money Wisdom During Downturn"
October 12, 2009 -- CNN -- "Protecting your Money"
October 2009 -- Credit Union Magazine -- "Evolution of Credit Cards"
September 28, 2009 -- CNN -- "Companies watching where you shop"
September 15, 2009 -- Marketplace -- "Credit card companies try new tactics"
July 8, 2009 -- Marketplace -- "10 purchases not to put on credit cards"
May 31, 2009 -- San Fransisco Chronicle -- ""Recession Likely to Change Credit Card Habits"
May 29, 2009 -- NPR -- "Good Credit Not Immune to Cuts"
May 24, 2009 -- CBC Radio -- Do Credit Cards Need More Regulation? May 18, 2009 -- NY Times Opinion Blog -- Credit Card Wars: Penalty for Thrift? April 1, 2009 -- NBC, Los Angeles -- Credit Card Rewards Points: Use 'em Soon, or Lose 'em? February 3, 2009 -- Marketplace -- "Credit cards take swipes at stability"
January 31, 2009 -- Good Morning America -- "'GMA' Gets Answers: American Express Reverses 'Where You Shop' Policy Following ABC News Investigation"
January 30, 2009 -- The New York Times -- "American Express Kept a (Very) Watchful Eye on Charges"
January 28, 2009 -- Good Morning America -- "'GMA' Gets Answers: Some Credit Card Companies Financially Profiling Customers"
January 28, 2009 -- UPI -- "Reduced credit may be someone else's fault"
December 29, 2008 -- CBS Morning News -- "America's Credit History"
December 19, 2008 -- NPR, Marketplace -- "A guide to new credit card reforms"
November 20, 2008 -- inside ARM -- Unrealistic Collection Expectations Drive Consumers to Debt Settlement. November 11, 2008 -- CBS News -- A New Way To Avoid Bankruptcy. October 6, 2008 -- RNews -- Dr. Manning discusses the credit crunch. September 2, 2008 -- CBC, The Current -- "Credit Card Crunch"
July 24, 2008 -- NPR, To the Point -- "Economic Decline in a Culture of Credit"
July 1, 2008 -- NPR, All Things Considered -- "Credit Crunch hits consumers, companies"
June 19, 2008 -- NPR, Marketplace -- "Small businesses turn to credit cards"
June 18, 2008 -- USA Today -- "How rising home values, easy credit put your finances at risk"
May 27, 2008 -- NPR, To the Point -- "The future of Energy: Is the U.S. Prepared?" April 19, 2008 -- Dr. Manning appeared on CNN's Your Money. March 10, 2008 -- Dr. Manning appeared on FOX Morning News. December 24, 2007 -- NPR, All Things Considered -- "Credit Crunch Hits Consumers, Companies"
November 28, 2007 -- Dr. Manning appeared on "To The Point" to dicuss if there is A Recession on the Horizon?. August 13, 2007 -- Dr. Manning interviewed by Jane Wells of 'On the Money', CNBC. May 25, 2007 -- Dr. Manning interviewed on the CBS Evening News. March 17, 2007 -- Dr. Manning interviewed in a podcast for the American Bankruptcy Institute. March 9, 2007 -- Dr. Manning interviewed on a Dutch news station -- "Amerikaanse Economie Op De Rand Van De Afgrond"
Dr. Manning interview on October 30, 2006 for NPR's Justice Talking, "Going Into Debt"
Dr. Manning interviewed on CNN's "In The Money," April 22, 2006, regarding the consequences of America's soaring consumer debt levels. Read the transcript. Dr. Manning's October 2005 LIVING WITH DEBT study, sponsored by LendingTree.com, is an analysis of changing attitudes and behaviors toward debt over the lifecycle. March 8, 2006 - Dr. Manning was interviewed on NPR's To The Point news program, "Drowning in Debt"
As featured on CBS Evening News! 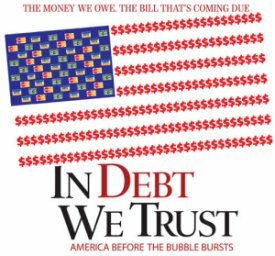 Powerful new documentary on consumer credit/debt by Danny Schechter and featuring Dr. Robert D. Manning. Dr. Manning announces new "History of Saving in America" project. 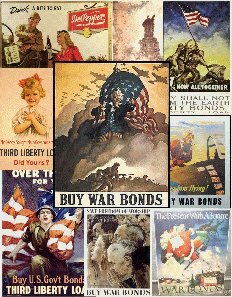 Includes opportunity to acquire historic World War I and World War II saving bond posters. Dr. Manning explained the RESPONSIBLE DEBT RELIEF program at U.S. Federal Trade Commission's workshop on Debt Settlement Industry on Sept 25th. Dr. Robert D. Manning is the author and inspiration of Credit Card Nation which has influenced public policy and research on consumer credit in the United States and abroad. 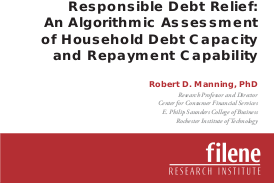 Dr. Robert Manning has contributed to state and federal legislation concerning the marketing of credit cards to college students, consumer bankruptcy reform, predatory loans, and financial education programs. Ralph Nader delivered the inaugural address for the Center for the Study of Consumer Financial Services (CSCFS) [Real Media Stream] at Rochester Institute of Technology on March 21, 2006. Dr. Manning is the founding director of CSCFS and the new Consumer Financial Services undergraduate program at RIT. Dr. Manning's discusses predatory lending and banking deregulation on the Al Franken Show (AIR AMERICA Radio Network) on Thursday, April 27th. See Dr. Manning on The Daily Show with Jon Stewart where he discusses marketing credit cards to college students during springbreak. View the "Beach Ploys" segment online! Click here for info on viewing your credit report for free. Consumer Bankruptcies soared to 2 million in 2005 following the enactment of the Bankruptcy Abuse Prevention and Consumer Protection Act of 2005. Dr. Manning, who testified against the legislation in the U.S. Senate Judiciary hearing in February 2001 and a U.S. Congressional policy briefing in May 2006, emphasizes that it not only threatens American's consitutional right of filing for personal bankruptcy protection but it is a hollow victory for the financial services industry since it will not deliver significantly greater payments to unsecured creditors. 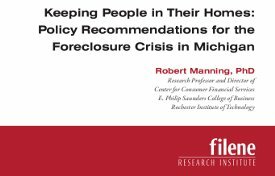 In his forthcoming book, GIVE YOURSELF CREDIT, Dr. Manning explains the implications of the new law to financially distressed consumers. Furthermore, major changes in the Consumer Credit Counseling Services (CCCS) is occuring as the IRS is rejecting nonprofit status to many creditor financed "nonprofits" as well as nonprofit counseling organizations associated with for-profit debt consolidation and debt relief programs. See IRS rulings while Module 12 is being revised. Click here for information on how to file for bankruptcy in your specific state.